If you watch my Instagram stories, it's no secret that I love a good sweat sesh and group fitness classes are my sweat of choice ;) I get a lot of questions asking where I workout, why I started doing two-a-days as of May, and how I have time to workout so much! SO, let's chat fitness. Working out is FUN for me! I've always been an athlete and very active, playing sports all through school, so group fitness is what I'm used to- having a team to push me. I currently work from home so working out is also my social hour! I love connecting with new people in new classes, and love connecting with the regulars at some of the gyms I go to; I have to make the most of all the human interaction I can get before I start my work day! I've made some amazing new friends through the Dallas Fitness Community, or #fitfam, as I like to call them! Fitfam friends are always a "yes," are so supportive, and have a "team" mentality that I LOVE! Shoutout to all of the amazing fitfam instructors and friends out there! If you haven't tried these studios yet, definitely come join me soon! I've worked out with StudioHop for years now and still love it- I'm an OG! For those who aren't familiar, definitely check it out; it's similar to ClassPass, but is locally owned in Dallas and is a huge community supporter! With my StudioHop unlimited membership, I can book one class per day and visit the same studio up to 5 times/month, which is plenty because there are so many great studios available! I usually workout 6 days a week, but I started adding in some two-a-day workouts in May because I wanted to be able to do cardio on days that I did pilates or yoga classes. Initially, it was TOUGH! Finding a class rhythm that worked for me was tricky, but three months later, I've got it down! Usually four days a week I'm able to do two-a-day workouts. Now, the hardest part of two-a-days is figuring out when to wash my hair and if I really need to get dressed between classes. ;) I normally go to a HIIT, weights, or pilates class early in the morning to get my day started, then do spin class in the evening. I've had a lot of questions about why I'm doing two-a-days, but again, working out is FUN for me and I love being able to go to different studios everyday! Of course I have my favorites, but I try to do a new workout or new instructor at least once a week. 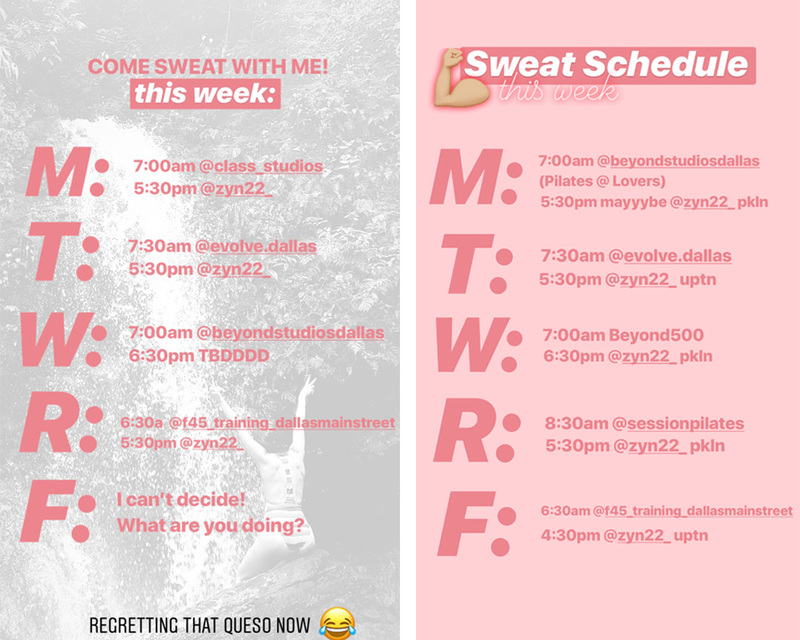 Including YOU in my fitness routine has been a fun way to get to know some of my followers and make new connections, and you've even given me some fantastic recommendations of new studios and instructors to try each week! Working out is definitely a time commitment, but I know that staying active is what gives me the energy I need to be able to work hard in other areas too! I love having a routine, but being flexible is key for me and if I have a day that will be packed with client meetings or deadlines, then I'm not concerned if I can only make it to one class, and I'll get back to it the next day! Rest days are also fun with tools like Cryotherapy (I go to Cryo1one and love it!) and Stretchzone (new, and I'm hooked! ), so I definitely do rest and listen to my body if I feel like I've been pushing too hard! Of course, cute workout gear keeps me motivated, and I love that I've gotten to work with some amazing fitness brands like Lululemon! Real talk: the Lulu sports bra in the photo above is the reason I do laundry (so I can wear it again asap! ), which probably means I need another one, right?! I announced last week that I am so excited to partner with Lulu to host an event with Dallas Blogger Brunch on August 4th, and I can't wait for some new friendships to come from that event! PS. Lululemon is opening their new store at Legacy West in Plano on August 1st!